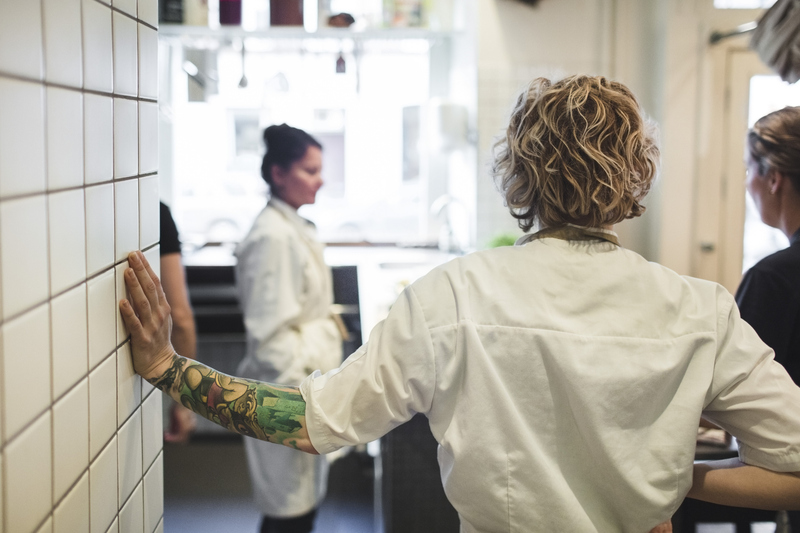 Why a lack of women chefs illuminates a larger disparity of women in leadership. When I first began making my documentary, A Fine Line, in 2014, I never would have believed less than 7 percent of head chefs and restaurant owners were women. Many people, including the greatest French chefs were raised on their mothers and grandmothers cooking. Personally, I never would have suspected such a disparity of women leadership in the culinary industry as I was raised in the hospitality industry with my mother owning and operating a successful restaurant for nearly 30 years. Initially when I embarked on this journey, it was to share my mother’s inspiring story — that even up against numerous obstacles as a divorcee in debt with two kids and a dream to open a restaurant — she was willing to make the necessary sacrifices to do what she loved while providing for her family. I believed then as I do now that everyday Americans have the greatest stories to tell, and that my mother’s was representative of many hardworking parents. Yet as I looked more into what some of these obstacles were and realized it wasn’t just my mother, but a majority of women who faced these barriers, I learned the hard truth that this was actually a systematic issue holding many women back from living their truths. Challenges like media bias, access to capital, sexual harassment, lack of affordable and accessible childcare let alone support for single parents and woman shaming for either doing too much or not doing enough. At the offset of making this film, all of these missing links started to connect and my mother’s story resonated on a much deeper level once I became a mother myself. I realized that even a generation later, many of these same barriers still exist for working women, let alone as a working mother. So I realized it was important to gather perspective and experiences from other accomplished women in the hospitality industry and got to hear from the likes of Dominique Crenn, Barbara Lynch, Lidia Bastianich, Cat Cora and more. The paramount question then is why are there so few women chefs and restaurant owners? Although some are quick to assume the obvious answer of a grueling , demanding job in terms of schedule and stamina, I find that more of a convenient excuse to keep women out, as opposed to the truth which is multilayered. And these same reasons apply across all industries that more often than not have very similar disparities in women in leadership. At first glance one would not assume that the culinary industry and tech would share any commonalities, yet the more I explored the data and studies of what women face in both these male dominated industries leading to such stark representation, the findings are alarmingly similar. Interestingly enough, beyond two very “bro-like” cultures that were not tolerant or welcoming of women, is a lack of mentorship, lack of opportunities towards advancement and lack of job security because of family planning and age discrimination. Meanwhile, these factors also contribute to a major pay gap. Although the patience needed to make a documentary and see it through to fruition can be maddening, it can also be an insightful process. To think of the changes that have already taken place over the past five years making this film is encouraging. When we began production a Time magazine piece had been published with the headline “Gods of the Kitchen,” and failed to mention one woman among a major spread and very long culinary history. This became a rally call for more women to justifiably ask, “What about us?” That question has led to many meaningful dialogues not only on the professional front for what is needed to create a more level playing field, but also personal conversations for families to figure out what can be done on the home front to create paths towards equal opportunity. Not only have we seen a visible difference over the past five years of more women receiving significant awards and media recognition, but also an exciting women’s movement that only continues to grow. And even more encouraging, men are also embracing the discussion on how they can be part of making change. This is the call to action the award winning film A Fine Line has since asked of its viewers. To talk with one another about our shared experiences and make change whether in our own businesses, homes or advocating legislators for paid family leave and pay equity. As the filmmaker wanting to pay tribute to my mom, it is most rewarding when women across the country who have endured similar situations approached me saying how much it meant to them to experience this film. That when they were watching they saw their own story. That they had just paid off their last credit card in order to start their business many years prior. Or crying mothers saying they hope their children will also understand the demands. Hearing how much this documentary reaffirms the commitment and love from these tireless women who have built communities around food, inspired me to create this 11-state Screening Tribute Tour. To recognize women chefs, farmers, restaurateurs, winemakers and activists nation-wide in honor of Women’s History Month. To spotlight every day women doing extraordinary things while impacting their communities and paving a way for more women leaders. Joanna James has a passion for sharing stories and creating empathy, first as a newspaper reporter and now as a filmmaker. Joanna is the founder and CEO of Zoel Productions, a production company based in Manhattan creating independent content for television, film, non-profits, commercial and digital spaces. Joanna made her directorial debut with the recently premiered documentary A Fine Line. The award winning film explores why less than 7% of head chefs and restaurant owners are women, hearing candid insight from world renowned chefs. There is a central narrative on a small town restaurateur, single mother who is on a mission to do what she loves while raising two kids with the odds stacked mightily against her. A Fine Line opens up a timely discussion about equality and leadership in the culinary field and beyond. Joanna developed the MAPP Impact Campaign with the mission of increasing women in leadership. MAPP endeavors to reduce the gender disparity in the hospitality and culinary industries, as a powerful model that could be scaled across all industries on how to get more women into leadership and create more inclusive teams. The tenets of this campaign are: Mentorship, Affordable & Accessible Childcare through Universal Early Childhood Education, Paid Family Leave Advocacy and the Power to Live your Truth and Influence Change. Prior to filmmaking Joanna was awarded best environmental reporting from the New England Press Association for an investigative piece she wrote. She interned for the Boston Globe's National/Foreign Desk and was later chosen to cover the 2004 Summer Olympic Games in Athens. She resides in New York with her two daughters and husband.